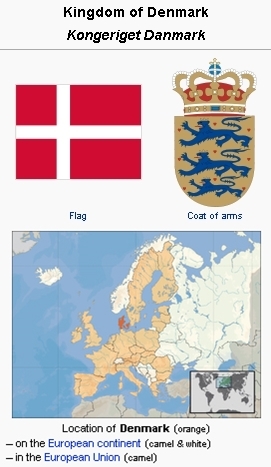 The Kingdom of Denmark is located in northern Europe and is part of Scandinavia. It is bordered to the south by Germany; Denmark is southwest of Sweden and south of Norway. Denmark borders both the Baltic and the North Sea. The country consists of a large peninsula, Jutland (Jylland) and many islands, and comprises 43,098.31 km2 (16,640 square miles). The population in 2008 was estimated at 5,505,995. At that time 82.0% of the population were members of the Evangelical Lutheran Church of Denmark, although church attendance in the country is very low. Lutheran teaching found early entry into Denmark in the 16th century and soon became the established faith. But Anabaptism was unable to gain a foothold here. Melchior Hoffman was appointed as Lutheran preacher in the Nikolai Church in Kiel. But because he expressed views on the communion contrary to Lutheran doctrine, he was expelled from the country after the signing of the Peace of Flensburg in 1529. In the next year he joined the Anabaptist congregation in Strasbourg. About the middle of the 16th century some Anabaptists expelled from the Netherlands came to Denmark, and since there were among them some skilled tapestry makers and goldsmiths and they were well behaved as a group, they were welcomed by private citizens at a number of places. But in 1554 King Christian III issued a warning to all clerical and government officials to be on their guard to prevent the infiltration of Anabaptists and ordered that every immigrant should be thoroughly questioned regarding his origin and religion. In the following year the order was repeated in sharpened form, to avoid the disturbances prevalent in Germany. Thus most of the immigrant Anabaptists were expelled; they had, however, won some followers. Two clergymen who joined them were Christopher Michelsen of Odense, and Laurentius Hellissön, provost of Lundeherrad. They were censured by a Lutheran bishop and warned by the "spiritual convent" in 1551. Nevertheless Hellissön baptized his grown son publicly at the beach near the Bridge of St. Anna. In 1557 they were arraigned in Copenhagen before a conference of bishops, professors of theology, and the King himself, and were declared guilty of the capital crime of lese majesty. The sentence was modified to life imprisonment, and they were incarcerated in Schonen and later in Soroe (Zeeland). In 1562 King Frederick issued the "Lüneburg mandate," which again urged and commanded the Holstein authorities to exercise careful vigilance to prevent the coming of Anabaptists. Apparently some slipped in, for in 1569 he issued 25 articles, making it mandatory for all immigrants to answer very pointed questions and to be watched by the police for some time after their arrival. In the spring of 1945 some 1,500 Mennonite refugees from East Prussia and West Prussia and Danzig were evacuated with some 200,000 German refugees from this region, to Denmark, by the German army and navy. At one time Mennonites were found in 34 different camps in Denmark where they remained for the most part until 1950. A small number went to Uruguay in 1948, and few to Canada, but most of them were finally allowed to enter Germany, a large part settling in the Palatinate. The Mennonite Central Committee served the refugees through a unit established in Copenhagen from December 1945 to January 1949. In 1947-1948 the Mennonites were found chiefly in nine camps as follows: Oxboel (near Vaarde), several hundred; Aalborg-Ost and Aalborg-West, 150-200; Grove (15 miles from Herning), 75-100; Rye (six miles from Silkeborg), 100 or more; Frederikshavn, 18-25; Krudttarnsvej (near Copenhagen), 15-20; Dragoer (near Copenhagen), about 12; Gedhus (near Herning, four miles from Grove), about 20; Rom, a family of five; and a group of seven in an old people's home in Aalborg. For further information see Danzig Refugees. The Danish historian, Fr. Hammerich, in his book, Den Kristne Kirkes Historie (1891), claims that Mennonites have been in Denmark since 1787. They supposedly came from North Germany and first settled near Frederikstad in Soenderjylland and Fredericia. They practiced immersion and called themselves "Mennonit Broederkirkens." The movement spread as far as Sweden. The first congregation in Copenhagen was established in 1871. It once had four meetinghouses, two in Sweden and two in Denmark, but lost them because of small numbers. A report by H. H. Janzen concerning contacts with this group in 1950, when it claimed 50 baptized members in Denmark, plus 25 in Sweden, 17 in Norway, and three in Finland, appeared in Mennonitische Rundschau 73 (1950) 27 September, p. 3, and Der Mennonit IV (1951) 7. Later information indicated that this mysterious group really was not a genuine Mennonite group. Andersen, P. A. "Die neuesten anabaptistischen Bewegungen in Dänemark.” Zeitschrift für historische Theologie. (1845): No. 2. Gering, W. "With Prussian Mennonites in Denmark," Mennonite Life 2 (October 1947): 12-14. Hege, Christian and Christian Neff. Mennonitisches Lexikon, 4 vols. Frankfurt & Weierhof: Hege; Karlsruhe: Schneider, 1913-1967: v. I, 388 f.
Hoop Scheffer, Jacob Gijsbert de. Inventaris der Archiefstukken berustende bij de Vereenigde Doopsgezinde Gemeente to Amsterdam, 2 vols. Amsterdam: Uitgegeven en ten geschenke aangeboden door den Kerkeraad dier Gemeente, 1883-1884: v. I: Nos. 1324, 1331. Neff, Christian, Harold S. Bender and Richard D. Thiessen. "Denmark." Global Anabaptist Mennonite Encyclopedia Online. February 2009. Web. 20 Apr 2019. http://gameo.org/index.php?title=Denmark&oldid=121942. Neff, Christian, Harold S. Bender and Richard D. Thiessen. (February 2009). Denmark. Global Anabaptist Mennonite Encyclopedia Online. Retrieved 20 April 2019, from http://gameo.org/index.php?title=Denmark&oldid=121942. Adapted by permission of Herald Press, Harrisonburg, Virginia, from Mennonite Encyclopedia, Vol. 2, pp. 35-36. All rights reserved. This page was last modified on 7 May 2014, at 06:44.